In Eastern Africa, where all tourism is based on safari packages and entrance fees for every single park and mountain, it’s hard to be a broke backpacker. On the other hand, it encourages you to stay off the beaten path and seek hidden places where the ministry of tourism has not spread its greedy tentacles just yet, and where community tourism is supporting the livelihood of local people. Tipped off by a fellow adventurer, soon after my arrival to Uganda I directed my steps towards a small border village near Congo, called Kilembe. Rwenzori mountains. Photo by Jørn Eriksson. Perched at the edge of Rwenzori Mountains National Park, the village is a popular set-off point for dedicated hikers who spend up to a week in the National Park enjoying the marvels of its wildlife. Ptolemy and other historians of antiquity referred to this mountain range as The Mountains of the Moon and the glacial source of the Nile. However, those of you who do not wish to venture into the Heart of Darkness, or simply do not have a few hundreds of dollars to spare, can spend a few days in the village and invest their money into community tourism. Rwenzori mountains. Photo by Anna Rudycheva. A place called Rwenzori backpackers is well known to local motorbike-taxi drivers. 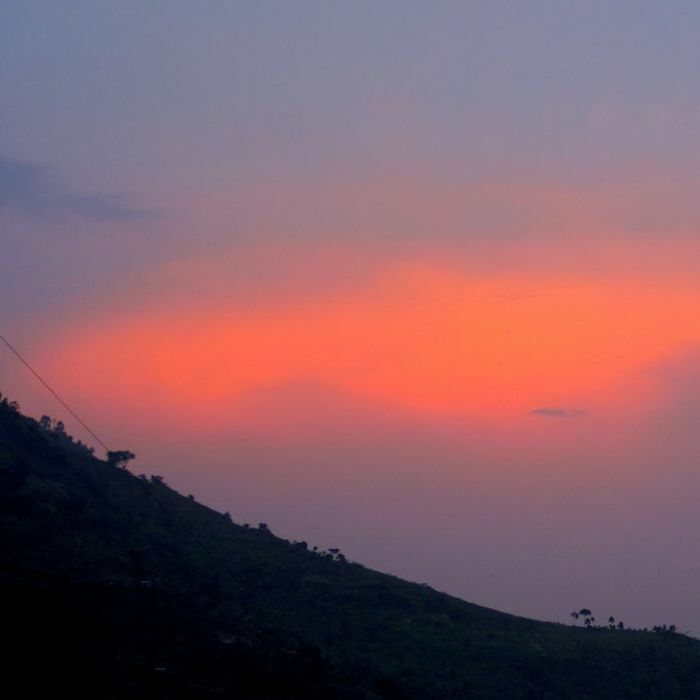 Upon arrival to the town of Kasese (accessible via minibuses from Fort Portal in the north and Mbarara in the south) take a moto taxi to Kilembe – the driver most likely will know straight away that you are staying at Rwenzori backpackers. When I stayed there in May 2013, the village had just suffered from a terrible flood and landslide. All of the bridges across the river and most of the houses in the valley were completely destroyed, and the whole place overall seemed like nothing more but a perfect setting for zombie apocalypse. I pitched my tent on the hostel premises like a boss and sat down on the wet grass to watch one of many crazy sunsets. Local house at sunset in Kilembe village. Photo by Jørn Eriksson. The following day, Rwenzori backpackers was empty, the sky was grey, and the overall eeriness of the surrounding landscape almost made me regret my decision to arrive here in the first place. Kilembe used to be big on copper production, and employed a lot of local people to work at the mine. The mine is closed now, but the fascinating surrounding area attracts more and more curious travelers to hike up the hills filled with coffee trees – that is, not during the rainy season. While trekking in the Rwenzori mountains requires an entrance fee, a hiking trail that runs across the nearby hills and villages is free and frequently used by local villagers. Rwenzori backpackers assigns you a guide, and a small fee that you pay for the day of hiking (it was $10 when I went) goes towards the guide’s salary and a common fund for community development. That year, after the devastating flood, Kilembe needed those money as never before. Kilembe village after flood. Photo by Anna Rudycheva. Local guide Nason showing waterfalls. Photo by Anna Rudycheva. Local kid before going to school. Photo by Anna Rudycheva. My guide, Nason, took me up and down the hill in a moderately fast pace, we made many stops for photos and occasional conversations with the villagers, among waterfalls and ancient trees. Coffee berries were still ripening, and the farmers were looking forward to the autumn harvesting season. I tried to imagine how far I could see from the top of the hill on a sunny day. ‘You can probably see Congo,’ Nason said. ‘It is just there, over the mountains’. Beautiful flora on the trek in Rwenzori valley. Photo by Photo by Jørn Eriksson. Chameleon in Rwenzori forest. Photo by Jørn Eriksson. 1. Rwenzori backpackers offers dorms, single and double rooms, or a place on their campsite. Bring your tent if you want to be super cheap. It’s also necessary if you want to go on a hike longer than one day. 2. Waterproof clothing is always a great item to bring along, especially in the rainy season (March-May, September-November). And rainponcho is a must! 3. Light sleeping bag with an extra fleece blanket. It will feel like sauna inside the tent when the sun’s up, but nights can get cold the higher you climb up in the mountains. 5. Travel towel and swimsuit. 6. Torch, headlamp and extra batteries. 9. Portable charger: small, medium and large. 10. Shops and food variety are very limited here, so try to bring extra snacks along with you from Kasese or even bigger town. 11. Strong mosquito repellent. Suckers carry malaria. Rwenzori rainforest view. Photo by Jørn Eriksson.